Bad Fructose? Increased Glycogen Synthesis, Reduced Glycemia, Higher Glucose Oxidation - When Do These Beneficial Effects Occur? And Why Don't They Prevail? Are there good and bad fructose sources according to the amount, concentration, and availability of the super-sweet super-cheap sweetener? Believe it or not: Fructose was not send by the devil to expel us from the gluttonous paradise of all-you-can-eat buffets. Rather than that, fructose is an important nutrient found naturally in fruit and a component of most healthy diets of which the following paragraphs will highlight that it plays a very important role in normal sugar metabolism. In contrast to the majority of the recently published literature on fructose, of which Maren R. Laughlin from the NIH writes in a recent paper that it is "not relevant for the purpose of understanding the metabolism of low levels of fructose eaten as a minor fraction of the carbohydrate found in a well-balanced meal", the article at hand will not deal with the ill-consequences of isolated fructose consumption, as they would never occur if people consumed a whole foods diet. Artif. Sweetened Foods Good, Not Bad for Fat Loss. This constraint does obviously reduce the pool of studies we can draw on to those whose authors are mindful of the fact that all foods, even "high fructose" fruit, always contain both, fructose and glucose. 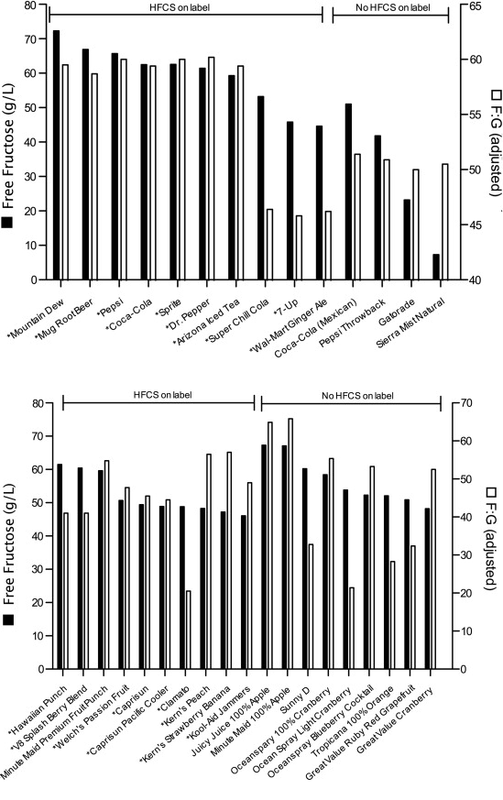 Figure 1: Free fructose content of popular beverages made with and without high-fructose corn syrup (Walker. 2014); Popular beverages made with HFCS have a fructose-to-glucose ratio of approximately 60:40, and thus contain 50% more fructose than glucose. Some pure fruit juices even have twice as much fructose as glucose and are not generally better than Pepsi, Coke & Co - better stay away! Fructose absorption is one of the few problems that have been known even before the whole fructose scare began. In practice, diarrhea and co will yet only occur, when fructose is ingested in (unnaturally) large quantities and in the absence of glucose. When fructose is consumed as part of the disaccharide sucrose (simple table sugar), or together with glucose at roughly similar or even higher levels of glucose, on the other hand, even those who develop diarrhea from fructose sweetened industrial foods will usually have no problem digesting it (Latulippe. 2011). The malabsorption issue, is yet only one out of several problems that occur in response to the extraction of fructose from its natural "sugar matrix". If we want to understand the synergy between fructose and glucose and why its disturbance has significant ill health effects, it's necessary to first look at how both are metabolized. While fructose enters the bloodstream more slowly than glucose and its serum levels are much lower, it will persist longer in the circulation. Le et al. (2012), for example, report that the fructose concentration in the peripheral venous blood rose >60-fold from a fasting level of about 0.005 mM to a maximum of 0.317 mM, and returned toward baseline levels by about 3 h when the subjects, 20 healthy adults, ingested 24 oz. of a regular soft drink containing 69 g sucrose (half of which, 34.5 g, is fructose). The glucose levels, on the other hand, rose from about 5.5 mM to 6.8 mM and returned to baseline after 90 min, already. A single soft drink is already more than the recommendations allow: I am certainly not a fan of the dietary guidelines, but when it comes to added sugars, the <26.2g/day (100kcal/day) limit of which you can argue that it may still be way too high would actually preclude any American who adheres to the dietary recommendations to consume more than 9oz (women) respectively 14oz (men) of the soft drink Le et al. used in their study. 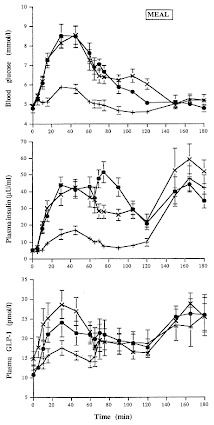 The ups and downs in glucose were accompanied by an increase in insulin release which peaked at about 30 min and the passage of fructose through the liver lead to a significant increase in lactate production, a major byproduct of hepatic fructose and glucose anaerobic metabolism, from 0.7 to 2 mg/dL at 60 min, (levels returned to baseline after 3h). Is fructose good for active individuals and athletes? In animal studies, scientists observed that even with an intake of 2 g/kg sucrose (in solution via tube feeding) there was only a minimal increase in the fructose levels in arterial blood from the aorta and peripheral venous blood, which both rose from 0.02 mM to about 0.15 mM. In the portal ein, on the other hand, the fructose concentration rose from 0.1 mM at baseline to ~1 mM after 30 min, and persisted at 0.6 mM when measured 60 min after gavage. 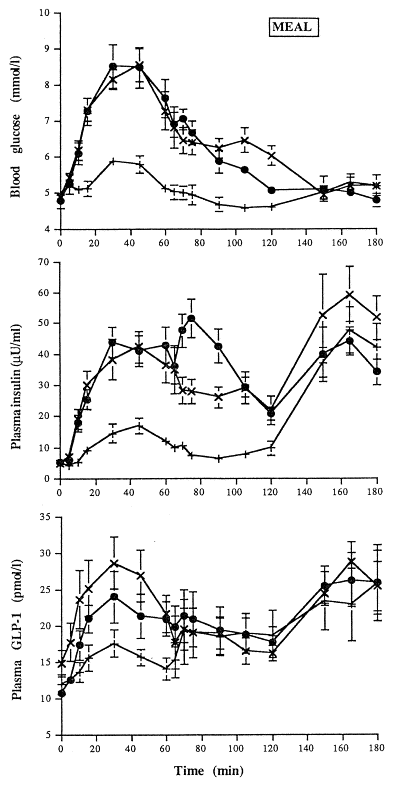 What's intriguing is that the aforementioned improvements in blood glucose occurred in the presence of a 21% reduction in plasma insulin in the type II diabetics, when fructose was present. Similarly, a low dose of fructose infused intravenously into type 2 diabetic patients restored the ability of hyperglycemia (and high insulin) to suppress hepatic glucose production and thus restored a major pillar of active glucose management in a 2009 study by Coss-Bu et al. (2009). As Laughlin points out in the previously mentioned paper, "a large part of the means by which fructose increases glucose disposal is due to its powerful ability to catalyze liver carbohydrate storage." (Laughlin. 2014) This effect was demonstrated in people using 13C nuclear magnetic resonance spectroscopy (MRS) during a hyperinsulinemic, euglycemic clamp (Delarue. 1993). Since the source of carbon for this extra glycogen was predominantly glucose, not fructose, the increase in glycogen storage did obviously correlate with a reduction in blood glucose levels. 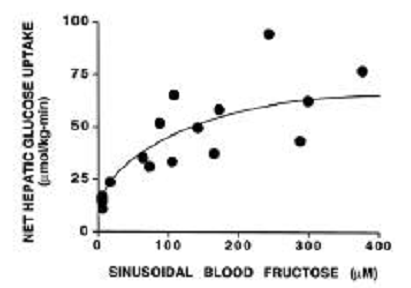 Figure 3: Relationship between net hepatic glucose uptake and the sinusoidal blood fructose concentration - more fructose, higher glucose uptake; but beware (!) there is a ceiling effect, i.e. 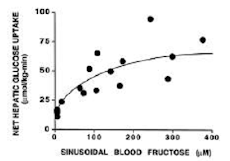 when a certain threshold is reached the marginal benefit of even more fructose is minimal (Shiota. 1998). The results of a dog study Shiota et al. present in a 1998 even suggest that the addition of fructose to a high glucose intake can increase the an increase in glucose uptake at constant glucose and insulin levels that's 10-fold larger than the increase in fructose uptake by the liver. If you take a closer look at the corresponding graph that depicts the hepatic glucose uptake as a function of the serum fructose levels in Shiota's dogs (see Figure 3) you will yet be reminded of the "more is not better principle" which - in this instance - indicates that the more fructose there is, the lower the marginal benefit is going to be. A negative effect at very high fructose levels as it you may have expected it based on the contemporary "fructose is the devil" scare does yet not exist. 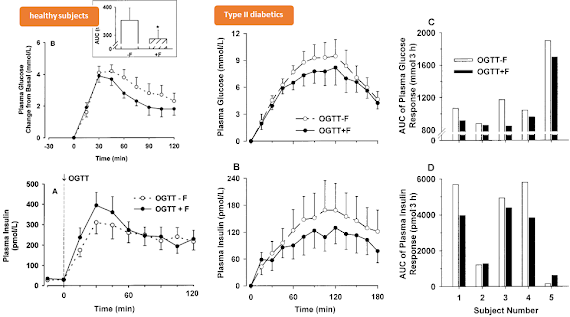 Although some of the beneficial effects on glucose levels may, in fact, be mediated by competitive absorption at the level of the GLUT-2 (glucose + fructose) transporters in the gut, it is thought that the major fructose effect on glucose uptake is via direct effects of fructose-1-phosphate on glucokinase activity, the hepatic isoform of hexokinase, which catalyzes the transfer of a phosphate group from ATP to glucose to form glucose-6-phosphate. 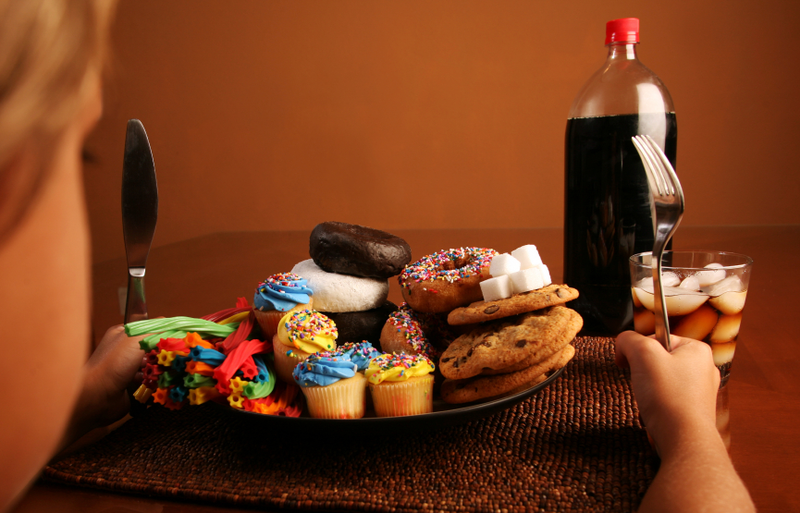 Hold on, isn't fructose bad for the liver? Well, when you achieve abnormally high fructose infusion rates by simply injecting a fructose solution in animals or people this may in fact lead to hepatic ATP depletion in response to the very quick transfer of its phosphate group to form fructose-1-phosphate. This energy loss will than induce detrimental changes in the energy status of the organ and have detrimental effects on your metabolism. However, severe ATP depletion is likely an artifact of fructose infusion. Hepatic ATP loss is minimal and transient after rats ate substantial fructose, enough to raise fructose-1-phosphate from 0.1 to 3.3 μmol/g wet wt (Niewoehner. 1984 & 1986). Or, put simply: Fructose controls / increases the storage of glycogen in the liver. Since the glycogen stores in the liver are limited, it should yet be obvious that the beneficial effects of fructose on glucose metabolism fail, when the hepatic glycogen stores are as topped off as they are in the average sedentary Western glutton on 365 days of the year. Apropos! Let's talk about the average Western glutton for a moment. In spite of the beneficial effects of fructose in different contexts, his habit of washing down his French fries and burgers with some neat high fructose corn syrup sweetened sodas is certainly not healthy. In the presence of already elevated glucose levels, the ingestion of high amounts of fast absorbing fructose has after all been shown to augment insulin secretion (Kong. 1999); and while this happens in the absence of a further substantial increase in blood glucose, it is still a hallmark feature of beginning insulin resistance. The data Kong et al. 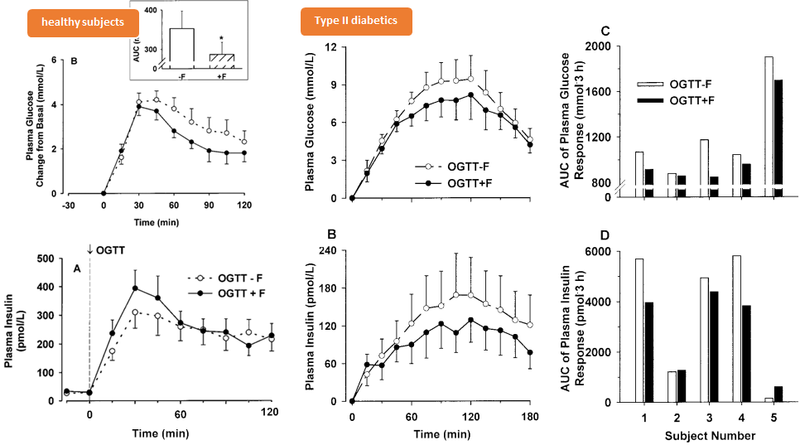 generated in healthy volunteers (Figure 4) does also indicate that fructose, when it is consumed in liquid, fast absorbing form and in amounts you can hardly get from whole foods (75g in a few seconds) will trigger both, a small transient insulin, as well as a GLP-1 (learn more) response, even if it is consumed in the absence of fructose (overall the effect is yet not physiological meaningful). It is likely that this is at least partly due to direct effects of fructose on the pancreatic islet beta cell, since high concentrations of fructose (10–30 mM) elicit insulin secretion from isolated human and rodent islets. Whether this is solely a result of active fructose uptake, or (also) the interaction of fructose with sweet taste receptors, will still have to be elucidated. What we do know already is that fructose will influence both the storage (see previous paragraph) and oxidation of glucose. What does the latest review say? The latest meta-analysis and review of the literature on "Fructose, high-fructose corn syrup, sucrose, and nonalcoholic fatty liver disease or indexes of liver health" says "the apparent association between indexes of liver health (ie, liver fat, hepatic de novo lipogenesis, alanine aminotransferase, AST, and γ-glutamyl transpeptase) and fructose or sucrose intake appear to be confounded by excessive energy intake" (Chung. 2014) and does therefore highlight one of the important confounding factors discussed in this article. In people during cycling exercise, for example, the combustion of ingested carbohydrate is 55% higher when fructose was present with glucose in a 1:2 ratio vs.glucose alone (see Table 1; Jentjens. 2005). Whether that's advantageous for cyclists is debatable, though. If we assume they are constantly replenishing their glucose levels via oral supplementation during the race, the answer is "yes"; if we assume they fail to do so, a reduced glucose and increased fatty acid oxidation would be more favorable. Needless to say, that the previously mentioned increase in lactate production and its usages as a substrate for gluconeogenesis contributes to a large extend to the increase in glucose oxidation (Lecoultre. 2010). Against that background it's yet somewhat surprising that fructose-specific GLUT5 is the second most abundant sugar transporter in human skeletal muscle, with expression levels of about a third of that of the major transporter GLUT4. High potential fructose uptake in those muscles, strength trainees love the most! In that, it's even more surprising that it's not the oxidative red fibers (type I) which tend to be particularly rich in GLUT4 and GLUT12 (the third most abundant sugar transporter) which express the majority of GLUT5 transporters, but rather the extremely "fast twitch" Type IIb (Stuart. 2006). And in fact, skeletal muscle has the ability to metabolize considerable fructose when plasma fructose is highly elevated, although it is not clear whether fructose is oxidized directly in muscle at the plasma levels found after a fructose-rich meal, we do know hat young healthy fasted men exercised on a bicycle during continuous infusion of fructose will use the fructose preferentially as muscle, not liver fuwl (fructose uptake during exercise (4.7 mmol/min) exceeded splanchnic uptake (3.8 mmol/min); cf. Ahlborg, 1990). 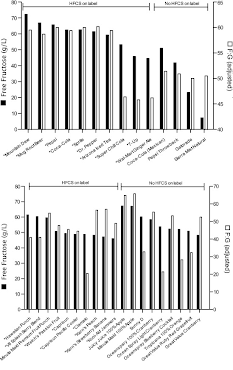 Interestingly, the use of fructose to fuel the muscle had no effect on the utilization of glucose during the workout and would thus have to be considered as either extra-fuel of fat replacement - since the oxygen uptake (not shown in Table 2) was identical, the second option does yet sound unlikely. What needs to be mentioned, though, is that the available data only confirms that These human skeletal muscle can directly metabolize fructose when plasma levels and energy demand are both high. In the average Westerner, it's yet usually only the former, i.e. high plasma levels, but not the latter, i.e. high energy demands, so that most of the obviously beneficial effects of glucose mentioned before won't even occur in the sedentary couch potato. While recent in vitro studies show that high concentrations of fructose may be involved in the maturation of pre-adipocytes to "grown up" fat cells, evidence that similar effects could occur in vivo is not available yet. However, even at lower levels, which mimic those found in the venous circulation following a fructose-rich meal (0.05–0.55 mM), fructose will potentiate adipogenesis and increase lipid stores in 3T3-L1 cells - albeit only in the presence of hyperglycemic concentrations of glucose. Therefore, physiological levels of fructose and glucose together can accelerate the expansion of body fat and contribute to the storage of carbohydrates in the adipose organ. It does thus appear realistic to assume that any form of fructose + glucose over-consumption, which is - as pointed out before - feasible only via processed foods, will abolish the beneficial effects that occur in the lean whole foods eating active individual and trigger all those nasty obesogenic pro-diabetic effects you will read about on the Internet on a daily basis. Bottom line: I am well aware that today's SuppVersity article lacks the popular hyperbole that is so characteristic of the debate about fructose and sugar in general. The fact that you still made it do the bottom line does yet tell me that you appreciate this diversion. I am not sure if the information changed your stance on fructose, but I hope that it lessened your (unwarranted) fear of the comparatively small amount of fructose in fruits and other whole foods that have falsely been lumped together with processed sugar-sweetened foods in the debate about the ill health effects of fructose and sugar in general. Ahlborg, Gunvor, And O. L. A. Bjijrkman. "Splanchnic And Muscle Fructose Metabolism During And After Exercise." Work 100.3021 (1990): 28-32. Coss-Bu, Jorge A., Agneta L. Sunehag, and Morey W. Haymond. "Contribution of galactose and fructose to glucose homeostasis." Metabolism 58.8 (2009): 1050-1058. Delarue, J., et al. "The contribution of naturally labelled 13C fructose to glucose appearance in humans." Diabetologia 36.4 (1993): 338-345. Hooshmand S, Holloway B, Nemoseck T, Cole S, Petrisko Y, Hong MY, Kern M. "Effects of Agave Nectar Versus Sucrose on Weight Gain, Adiposity, Blood Glucose, Insulin, and Lipid Responses in Mice." J Med Food (2014). Ishimoto, Takuji, et al. "Opposing effects of fructokinase C and A isoforms on fructose-induced metabolic syndrome in mice." Proceedings of the National Academy of Sciences 109.11 (2012): 4320-4325. Jentjens, Roy LPG, et al. "Oxidation of combined ingestion of glucose and fructose during exercise." Journal of Applied Physiology 96.4 (2004): 1277-1284. Kong, Marie-France, et al. "Effects of oral fructose and glucose on plasma GLP-1 and appetite in normal subjects." Peptides 20.5 (1999): 545-551. Latulippe, Marie E., and Suzanne M. Skoog. "Fructose malabsorption and intolerance: effects of fructose with and without simultaneous glucose ingestion." Critical reviews in food science and nutrition 51.7 (2011): 583-592. Laughlin, Maren R. "Normal Roles for Dietary Fructose in Carbohydrate Metabolism." Nutrients 6.8 (2014): 3117-3129. Le, MyPhuong T., et al. "Effects of high-fructose corn syrup and sucrose on the pharmacokinetics of fructose and acute metabolic and hemodynamic responses in healthy subjects." Metabolism 61.5 (2012): 641-651. Lecoultre, Virgile, et al. "Fructose and glucose co-ingestion during prolonged exercise increases lactate and glucose fluxes and oxidation compared with an equimolar intake of glucose." 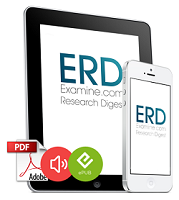 The American journal of clinical nutrition 92.5 (2010): 1071-1079. Moore, M.C. ; Cherrington, A.D.; Mann, S.L. "Davis, S.N. Acute fructose administration deceases the glycemic response to an oral glucose tolerance testin normal adults." J. Clin. Endocrinol. Metab. 85 (2000):4515–4519. Moore, M.C. ; Mann, S.L. ; Davis, S.N. ; Cherrington, A.D. "Acute fructose administration improves oral glucose tolerance in adults with type 2 diabetes". Diabetes Care 24 (2001):1882–1887. Nemoseck TM, Carmody EG, Furchner-Evanson A, Gleason M, Li A, Potter H, Rezende LM, Lane KJ, Kern M. "Honey promotes lower weight gain, adiposity, and triglycerides than sucrose in rats." Nutr Res. 31,1 (2011):55-60. Niewoehner, Catherine. B., et al. "Metabolic effects of oral fructose in the liver of fasted rats." Am. J. Physiol 247 (1984): E505-E512. Niewoehner, Catherine B. "Metabolic effects of dietary versus parenteral fructose." Journal of the American College of Nutrition 5.5 (1986): 443-450. Stuart, Charles A., et al. "Hexose transporter mRNAs for GLUT4, GLUT5, and GLUT12 predominate in human muscle." American Journal of Physiology-Endocrinology and Metabolism 291.5 (2006): E1067-E1073. Stuart, Charles A., et al. "Cycle Training Increased GLUT4 and Activation of mTOR in Fast Twitch Muscle Fibers." Medicine and science in sports and exercise 42.1 (2010): 96. Walker RW, Dumke KA, Goran MI. 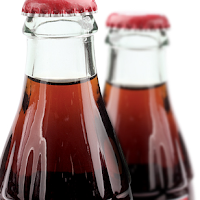 "Fructose content in popular beverages made with and without high-fructose corn syrup." Nutrition 30, 7-8 (2014):928-35.